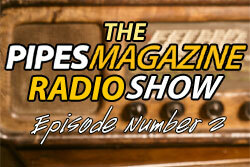 It’s a pleasure to bring you the 2nd episode of the Pipes Magazine Radio Show starring Brian Levine. This second show will have our first interview. We’ve already had requests for pipe maker interviews, so we decided to fulfill those requests by making the first interview with Canadian pipe maker Michael Parks. Brian also discusses the differences in factory pipes, artisan pipes, and high grades. Just what is the difference between an artisan pipe and a high grade? Listen to the show to find out. In this episode, you’ll also find out how a Britney Spears song can be transformed into something that is actually cool and not too bad to listen to. Finally, Brian ranks on Ikea, but also discovers a fun new place to smoke a pipe and be entertained. We hope you enjoy our 45-minute show produced just for you—the pipe smoker and collector. The following link will launch a pop-up player (it works in Internet Explorer now). Alternatively, you can download the show in iTunes after the initial broadcast is complete here. If you can’t afford it, it’s a High Grade Pipe! Ha ha ha ha ha ha ha!!!!!! Artisan or high grade,doesn’t matter I can’t afford either. I like factory pipes - Dunhill, Stanwell, & Comoys. I have or had pipes in all the categories. However, you can have a great smoking pipe in any of the categories and a real stinker in any of the categories. The probability of a great pipe goes up with the category and the probably of a stinker goes up as you go down in category. The great thing about pipes is that you never know how a pipe will turn out. I love the show. The interview with Michael Parks was great. I commissioned his first hawkbill pipe from him many years ago and still have it in my collection. John, I didn’t know you liked Hawkbill pipes!? I thought it was a good show. It would be cool to hear from a meerschaum pipe maker but it might be hard as they are all in turkey. The cowboy ice cream commercial didn’t offend me. I am a firm believer in free speech and against censorship. Thanks Kevin, Brian, and Michael Parks. Entertaining! It was interesting to hear a pipemaker’s thoughts about the craft. I think I would enjoy hearing more of those sort of things. The ranking of pipes was an interesting subject as well, though that may be a subjective matter. I would have thought that the briar quality used would have some degree of influence on whether the pipe were a high grade or not. Maybe I slept through that part? No doubt about what makes an artisan grade pipe, however. Thanks for the show! Great, innovative show, and nice music! Great Show! I was busy last night and it was good to catch the show this morning in the office. Boy that 45 minutes went quick! I wouldn’t be opposed to a Howard Stern-esque 4 hour format. More pipe maker interviews for sure, That was very interesting. Much better show than the first. The interview with Parks was really good. The rant on IKEA was amusing. I think to the answer to the trivia question is Tsarina Catherine the Great, but in all likelihood it is an apocryphal answer. Last nights show was OK but I think the 1st show was better, sorry that’s just my take on it. I for sure will keep tuning in you have a good thing going. Love the first two shows. Keep ‘em coming! Great show and very entertaining. Thanks Brian and Kevin for providing us with some great content. No other pipe site on the net compares to this one for content, activity and just plain fun. I like the program. Keep it up. Cigar band: Queen Victoria. Great show, thanks! I was definitely taken aback with the “number one rated…with the last name ‘Levine’.” I wondered: How the heck do you program the audio clip to call me by name. A couple seconds later, I found out that I’m not the only Levine around here. To rich for my blood, although i buy Castellos and Ashtons, but slightly used, save a lot of money that way, but great show..
Artisan or high grade, price and/or classification are never indicative of how well a pipe smokes. As seilerjp pointed out “you can have a great smoking pipe in any of the categories and a real stinker in any of the categories”. Allow me to share an advice that Alex Florov gave my friend once: “You can make a pipe that will look like [and probable sell for] a million bucks. However, if it is not “engineered” properly, it is worth S%#T (you guys can figure the word out)!” The pipe will not smoke properly. It will be useless. It may very well, to use Brian’s own phrase, serve as bookends, or as Michael pointed out, serve as a projectile. However, I will agree with Rick that Michael Parks does turn out some of the very best high end pipes. Brian, this is a great show, great format. Would love to hear more from pipe makers, tobacco manufacturers, different pipe clubs - their activities, etc. Great show guys. Michael Parks is a class act. Commended by JT Cooke no less. I listened to the interview smoking my commissioned Michael Parks blast billiard. Star of the East. Keep up the great work, guys. Finally! A podcast for the pipe smoker! GREAT show! Keep it up Brian!!! Can’t be Queen Victoria as she was a staunch non-smoker. Great Show-I’ve been a pipe-smoker for over 50 yrs-enjoy hearing about pipemakers.I’m lucky to belong to The Capitol District Pipe Club -we meet monthly and are fortunate to have as our leader Russ Oulette (Master Blender). I’m most interested in hearing about Estate pipes-(Most popular- best buys-most collectible. )I favor English and Italian pipes but have started interest in American artists as well. Keep up the good shows!!! Enjoyed the show. The reason I listened was that you were going to explain the difference between artisan and high grade. When the time came, you said you didn’t know. How about defining it better, maybe by giving the names of the high grade makers. By the way, I am listening to this interview as I write this. I want to know details. How do you select briar? How do you cure it? What stains do you use? Are they tasteless (the stains)? Must the draft hole have to be at the exact bottom of the chamber? Do you use a flexible shaft rasp to shape between the shank and bowl? Stuff like that. Thanks. Amazing! Your questions to your guest were pertinent and probing! I look forward to your future shows.